So, I tried out running with my pepper spray. Here's what it looks like: it has a little Velcro strap that you wear around your hand. It even has a lady running on the front of it! At first glance, it did not seem like this would be the best way to carry it, so I tried it strapped on to my various things already attached to me (water bottle thing, ipod armband, watch, etc.) and after I practiced a few "quick draw" movements I realized, maybe they say to carry it like that for a reason. Because the clip CAN get stuck on the other strap thingy if you need to get it out, and that would not be very good. So, off I went, at thebuttcrackofdawn, all armed and ready. Yes, the part in my palm got a little sweaty, and I got a few weird looks, but all in all I would call it a success. OH! And of course I HAD to practice shooting it a little outside. And it's a good thing I did. My only other experience with this kind of thing was a HUGE canister of "Bear Spray" I used to carry when I worked at a zoo. That had a very powerful, very loooooong spray. It's was like a mini fire extinguisher. This thing squirted out a very dinky yellow stream of spray. So, my aim will have to be very good!! 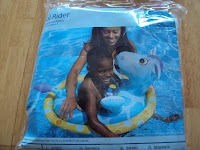 Also, I bought this thing for #2 to use at the pool. I've seen other moms using something similar, which is yellow, and a bit more sturdy than the mesh baby ring things that most people use for babies. But that thing has a 30 pound weight limit on it, and #2 is much more...um...sturdier than that. So then I found this thing that says 30-50 pounds. JACKPOT. And it was only $5! So, we'll see how it goes, I'm gonna try it out this week. If he's just in a toddler pool he's fine, but I need something for our neighborhood pool which doesn't have one of those. Usually he just stays on the steps with his puddle jumpers life vest thingy, which he HATES, and I want to get him used to being in the middle of the pool. Right now he is not on board! As soon as he turns 3 that child is going into swim lessons! I have no idea what kind of animal this is, the package says "Donkey" but....I'm not sure...any guesses?? Also, we have set a date for our long-awaited garage sale. TWO WEEKS. ugs. The goal is to clear enough to purchase some extra free-standing kitchen cabinets that we will be able to take with us whenever we move again. I'm not sure that we will tho :( Because I am DYING with the 3 square inches of cabinet space I have. Almost all of my baking stuff and smaller appliances, casserole dishes, and holiday plates and stuff are still in boxes in the garage. AND, I have to park my car outside while working on this stuff, because our garage is so full we can only get one car in there anyway. And I KNOW it's not TX, but geez, it's been really hot here. Husband is a little tired of me complaining about the heat and says he's about to ship me back there for a week and that'll fix me. 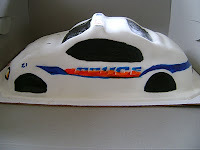 In honor of our city's finest patrolling our neighborhood, here's a pic of a Police Car cake I made from a picture of a coworker of husband's boyfriend's squad car. It was a surprise and I hear it went over pretty well.